Having been dropped off at Situ’s mooring station next to the Rani resorts we proceeded to Russel’s cottage , where we met up again with Paul who stayed behind in order to repair some electrical problems with his car. Mark and Willy met with Paolo and Peter to discuss some issues regarding buildings on their plot in Pemba. Thereafter we all proceeded to stock up supplies and fill the motor cars up. We left Pemba at 11 am on the way to the Tanzanian border leading us through towns like Meduge , Macothia, Chai and eventually Mueda. The road as from Chai was an unbelievable stretch of pothole assemblies and put real strain on drivers and vehicle. Every now and then a few strips of tar surrounding huge potholes keep reminding us that this must have been a fully tarred road some time ago. The original plan was to find some camping site in Mueda – but after driving through this 2km stretch of African village we all decided that we would be better off driving to the actual border post some 130km km away. Darkness started to set in some 30km away from Mueda and we needed to quickly find some space for as bush camp. This might sound relatively easy but one must visualize sandy dirt road covered on either site with thick bush and no place to just park off. We were lucky that after 33km out of town coming to a Y junction we saw a sand quarry on the left with just enough space to move all the cars in and setting up camp. 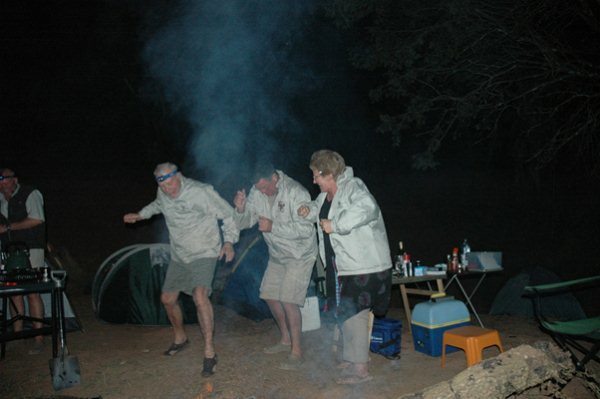 Being at 780 m above sea level the temperature dropped to 12 degrees that night – but all were kept warm with the camp fire and some suitable refreshments of the liquid type – together with a braai. 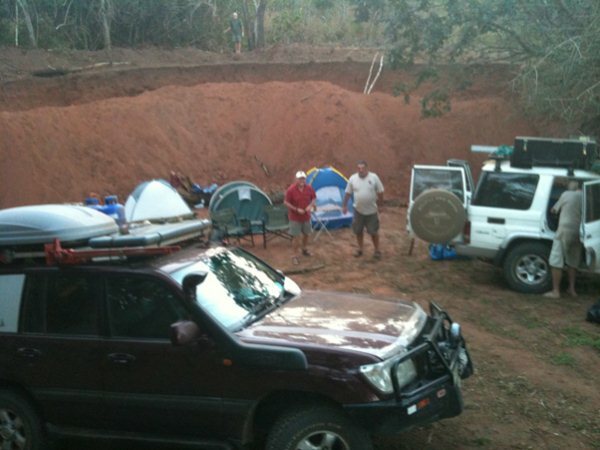 Setting up bush camp in an old sand quarry…. 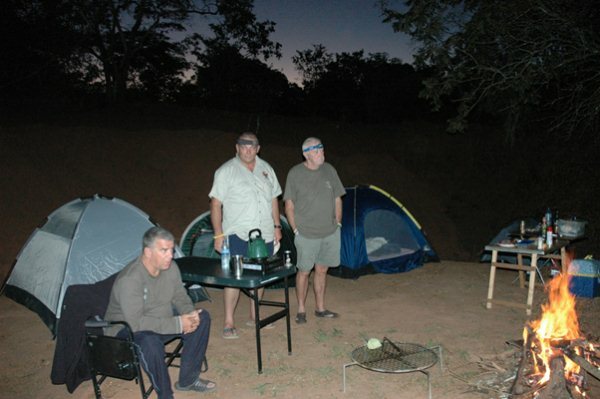 Bush braai shortly after sunset 33km after Mueda on way to Tanzania Border…..
Look like you are having a great time dad. I mi** you. And *low down you are NOT 21 anymore. Mike, Mark and Noel. Hope you going to teach us that dance when you get back! Wow looks like such fun!